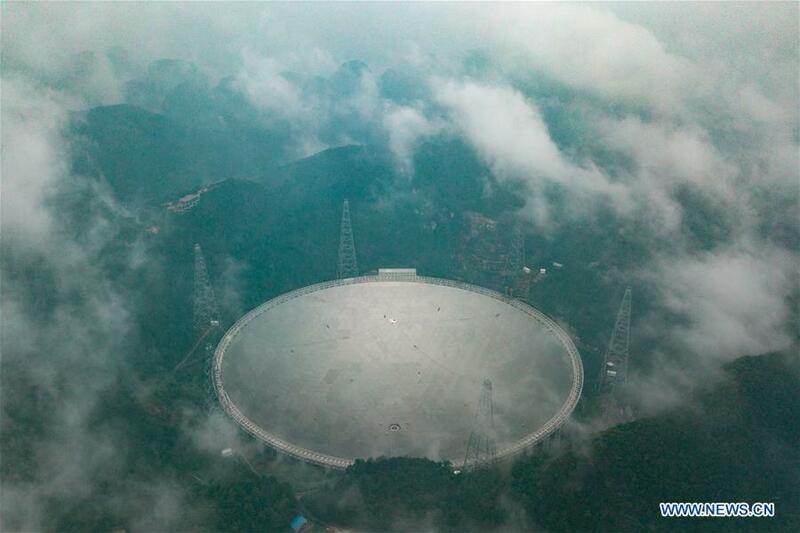 China’s Five-hundred-meter Aperture Spherical Radio Telescope (FAST) in Pingtang, Guizhou province. Guizhou Province, home to China’s Five-hundred-meter Aperture Spherical Radio Telescope (FAST), has made great efforts to ensure normal performance of the telescope while continuing to develop its economy, Science and Technology Daily reported. FAST, the world’s largest single-dish radio telescope, has brought a tourism boom to the once-poor Pingtang County, southwest China’s Guizhou Province, where it was built. Local media reported that the county achieved almost 5.5 billion yuan in tourism revenue during the first half of 2018, up 38.7 percent from the previous year. About 5.1 million tourists visited the area during the same period, a year-on-year growth of 40.6 percent. The county has set a daily limit of 2,000 tourists and implemented restrictions to make sure the telescope doesn’t impact tourists. For example, tourists are required to pass several security checks and deposit all their electronics at the visitor center such as cell phones, smart bracelets and tablet computers before visiting the telescope. Additionally, they can only overlook the telescope from a purpose-made viewing platform. Those who want to take photos can rent film cameras at the site. “Although it is troublesome, we can totally understand. We don’t want to cause interference to the telescope,” said a tourist. Moreover, those living within five kilometers of the telescope have already been relocated. The county has also shut down nearby radio stations, mobile communication base stations, and mines to save the telescope from interference of peripheral radio frequency signals, so that it can capture extremely faint radio waves from deep space objects, said Zhang Shuxin, deputy manager of the FAST project of the National Astronomical Observatories of China (NAOC). The electromagnetic environment is also of great scientific significance, Jiang Peng, chief engineer of the FAST project of NAOC noted, adding that the current overall quality of the electromagnetic environment of the telescope is good. Tourism has promoted local economic development, contributing to poverty alleviation. However, how to balance scientific exploration and local economic development while making the best of the telescope is an issue that both NAOC and the province need to confront together. Chinese astronomers are expected to begin using FAST in 2019, Jiang noted.